Pre-treat clothes, carpet, and upholstery with a Made in the USA natural stain remover that uses plant power to break down grass, grease, dirt, and other stains—even ones that are years old. The plant enzyme-based formula is non-toxic, hypoallergenic, and biodegradable, and contains no fillers or additives, so you can feel good about using it—and marvel at how crazy-good it works. Dimensions: 25 oz. : 2.8" x 10.6" x 3.5"; 4 oz. (Set of 3): 6" x 4" x 2"
Weight: 25 oz. : 1.7 lbs. ; 4 oz. (Set of 3): 1 lb. Used this product once and put it on a dried blood stain. Came out. Like the fact that it is not chemical based. Ingredients sound like a great digestive aide! We had to see for ourselves. And when we tried the stain remover, we became believers, too. 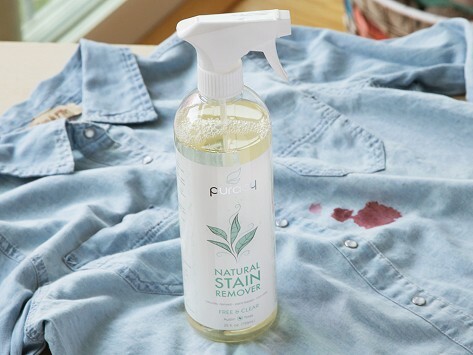 It removed a blood and grease stain, and it did it without any of the less-than-desirable ingredients found in typical stain removers. Puracy is non-toxic, hypoallergenic, biodegradable, and there are no fillers or additives, either. The formula contains six plant enzymes carefully selected for their ability to break down stains—like lipase that targets oil. The lab-created remover was tested by doctors (and laundry-doers) to ensure its safety and effectiveness. We think Puracy beautifully balances both. It’s a powerful stain treatment that gets the job done without needing anything harsh to do it.